The spores are produced inside perithecia lining the surface of the irregularly club-shaped fruiting bodies. These are 3 -8 cm high. 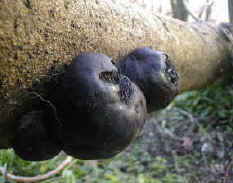 The fruiting body is a like an irregular hard, woody ball, brown initially, later becoming black. It gets its specific name 'concentrica' from the fact that if the balls are cut open, the inside is zoned in concentric rings. The perithecia line the under-surface of the fruiting body. 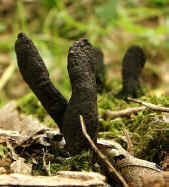 The fungus' common names derive from its look of burnt cakes and from the old belief that it was a cure for cramp. The fruiting bodies are a good place to look for insects, including fungus weevils and other beetles. Habitat: Fruiting bodies can be found all year round, often packed together on the dead wood of deciduous trees, especially Beech and Ash. Asci are produced on the fertile yellow/orange head of the fruiting body. This is carried on a white stem. The fruiting body is small, only 1 - 4cm high. Habitat: In damp areas on rotting leaf litter and twigs. 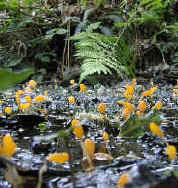 Fruiting bodies are produced spring to summer.